The A3 control panel offers a simple and convenient solution for complete control of your steam bath. The panel blends discretely and elegantly into the space with its clean lines and refined design. The easy-to-read display provides a full overview of power-on time, temperature and lighting. Program your steam bath for up to one hour of use or use the delayed start function allowing you to turn the generator on with a delay of 1-10 hours. The A6 touch control panel displays the temperature and run time. It can be programmed to start up to 24 hours in advance, and can run from 15 minutes up to 24 hours. It allows you to regulate all existing features in your steam room such as lighting, temperature settings and different languages, with even more advanced functions. It is designed to be wall mounted outside or inside the room for ease of use. You have the choice of surface or flush mounting through the use of a recessed mounting box, with a trim ring to match the selected finish, that is included in the kit. You can connect it to an external switch or even link it to most smart home solutions. The A6 control remembers individual user preferences for time and temperature settings plus fragrance and lighting options. For ease of use and convenience, we have developed the amerecConnect™ functionality for smartphones and tablets. Take total control over your steam bath experience from the palm of your hand. Configure and set it to your individual desires for optimal performance. Relax even before you go into your steam bath. With our mobile version of the amerecConnect™ app, you can control your home spa from within your home wi-fi network on your Apple and Android devices. Also available as a PC app. The apps are free of charge with purchase of A6. 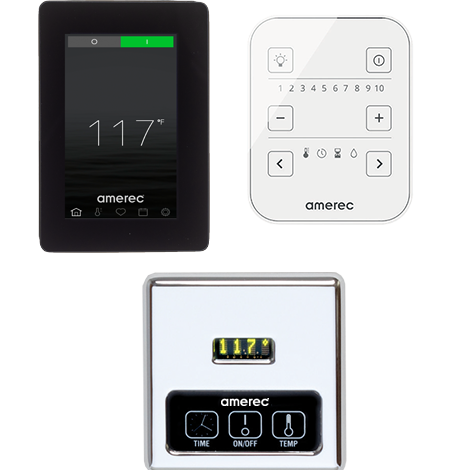 Amerec offers a wide variety of control options for AK generators that let you tailor your own steam bath experience to your exact personal specifications. Each unit comes in your choice of metal cover finishes (polished chrome, polished nickel, brushed nickel and oil-rubbed bronze). All kits include the ComfortFlo™ steam head and all the cables needed to connect the control to the generator. For AX Generator and A6 Control Only Imagine being able to step into the gentle, healthy heat of cleansing steam within 60 seconds of turning the generator on. The ”Warm Start” option keeps water in the tank preheated to a temperature just below a boil, reducing the time required to heat the bath by several minutes. And if you won’t be using the steam bath for an extended period, a simple on/off switch lets you deactivate the preheating option to save on power consumption. The ComfortFlo™ steam head is designed for optimal steam dispersion providing more even heat throughout the steam room and reducing the time required to reach the desired room temperature. It ensures that each steam bath is perfect and invigorating. Steam is delivered into the room emitting a soft pink noise, which is a component inducing a higher state of relaxation and better sleep. The ComfortFlo™ steam head features a fragrance reservoir allowing the bather to enjoy the benefits of aromatherapy using their favorite fragrance. Get started with one of our commercial custom steam room experts.